A collection of all three of the award-winning Clayburn novels. 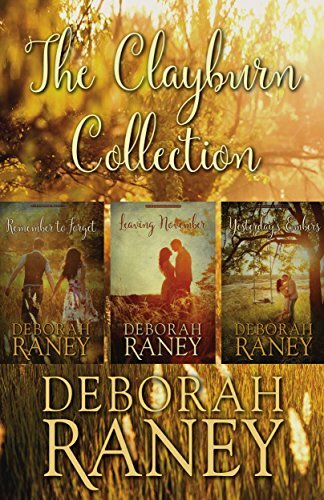 Six people longing to mend broken hearts and shattered dreams… Three romances ready to blossom in the charming Midwest town of Clayburn. LEAVING NOVEMBER: Eight years ago, Vienne Kenney moved away from Clayburn and all its gossip to pursue a law degree in California. But now she has failed the bar exam…again. Is she destined to be stuck forever, a failure—just like her father—in this podunk Kansas town? YESTERDAY’S EMBERS: On Thanksgiving Day, Douglas DeVore kissed his beloved wife good-bye, unaware that it would be the last time he'd see her—or their precious daughter Rachel. Left with five kids to raise on his own, and already juggling two jobs to make ends meet, Doug wonders how he'll manage moment by moment, much less day after day, without Kaye's love and support.